Aerosmith guitarist Joe Perry took to Twitter earlier this morning to tease his upcoming Les Paul Signature model. The new instrument, which can be seen in a short video clip posted by the guitarist, sports a Gold Top finish along with a single humbucker in the bridge position and what appears to be a Wilkinson Strat-style tremolo system. 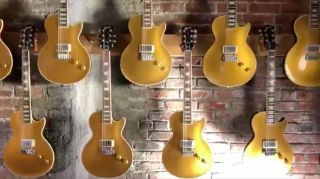 Gibson has yet to release any official details about the new Perry collaboration, but Guitar World will update the story as details are made available.